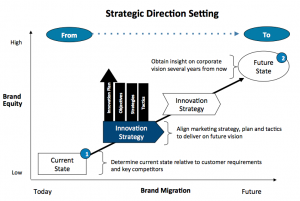 Strategic direction setting is the first step in driving consistent, sustainable innovation. It moves well beyond “I have an idea,” to provide the required structure, discipline and creativity. Our innovation and new product consultants draw on best innovation practices, customer insight and internal assessment to establish the strategic guideposts for innovation. What can be learned from a diagnostic audit of prior company innovation efforts? What are the current and emerging drivers of current and related category demand? What are the strategic, financial and operational screens that must be met? What is the initial set of growth levers and opportunity areas (e.g., equity extension, new products, technology leverage, etc.) to consider? Contact EquiBrand for information about how an experienced innovation consultant or new product consultant can help.